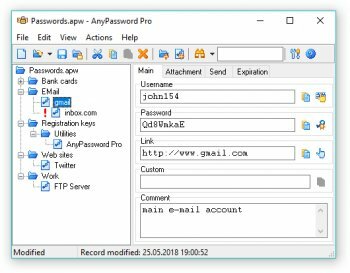 AnyPassword Pro is a professional to take care of your passwords. Now and onwards all your passwords will be stored in one secure place. Hierarchically structured folders, in which you keep your private data, can be (re)named and arranged in your own way. Too basic for me. I know of at least 3 freeware programs that do more. It doesn't type in the data for you or have drag-n-drop capabilities. Not using the clipboard or allowing a clipboard or keyboard monitor to capture keystrokes or the clipboard are of paramount importance to me in a modern password generator/manager. Best Password saving tool ever IMHO. Been a paid user for years now. Updates are few and far between, but how can you fix perfection? This version 107 seems to load much quicker then my previous 105. Installed to my Dropbox folder by using "Install to Removable Device" Tool, I can access and change my passwords from any computer. If there where only an Android version. Excellent. I've been using 'AnyPassword Pro' for years. Well thought application, feature-rich, easy to handle, efficient, handy.